This week I’ll be taking a rare “business” trip to a teaching conference in Paris. When I say rare, I mean this is basically something that only happens once a year. And while it’s technically work time, I’m hoping to find a few free hours to enjoy myself in one of my favorite cities. How will I spend it? If time is money, it seems to follow that time to myself means time to spend money, or at least that’s how it tends to work out for me. Of course, my travel and hotel are paid for, but everything else is on me. And particularly in a big city, with all the temptations that I don’t have at home, it’s going to be hard to resist the allure of a coffee to go from Starbuck’s and a chance to stock up on English books at Shakespeare and Co. So I’m trying to come up with a plan beforehand, in the hopes that being at loose ends won’t leave me with a big hole in my wallet. An important part of traveling frugally is packing well. Because I’m only going for a day and a half, I won’t be bringing much besides my school bag and an overnight case. I need to be sure and pack the former very carefully, keeping in mind what I’ll need for the day out and about without having to stop and buy something I’ve forgotten. The big one for me is water-I always forget to pack a water bottle, and I always need one. I also need to remember to refill it whenever I get the chance and to use the restrooms where I can, as otherwise I’ll end up having to pay to use a public one. Finally, I need to remember my tickets for the metro, of which I bought a ten-pack last year and still have several remaining. The best part about Paris is that it’s simply beautiful to look at; just walking around and taking in the sights is entertainment in itself. You can explore Notre Dame Cathedral, stroll along the Seine, and climb the steps of the Sacre Coeur all without spending a single centime. If I were going on a weekend, many of the top museums are free the first Sunday of the month, but I’m going to be there mid-week. However, there are still several smaller museums that are free of charge, and I’ve been wanting to visit the house of Victor Hugo, which contains many of his first edition manuscripts. It’s also right down the street from the MusÃ©e Carnavalet, another (free) museum I’ve never been to, which is dedicated to the history of the city of Paris. After my culture fix, I’ll have time for a walk before dinner. Both museums are located is a neighborhood called Le Marais, or “The Marsh”, which used to be a ritzy residential area before the aristocracy migrated to Versailles with the royal family. Today it’s a mixture of several communities, and it’s a great place to wander and peek in the windows of chic clothing stores. Historically, it has a large Jewish population, and my plan for dinner will be falafel from one of the many local stands. Not very French, but then again I live here, so I get French food all the time. We’ll see how well I do at sticking to my frugal plan for Paris! btw, you’re bringing a water bottle w/o water onto the plane right? Thanks! And not to worry, I’m taking the train so don’t have to worry about all the flight restrictions. Whew. The best things in Paris are free or almost free. Take the metro at first, but then use the bus (you get to see everything). Spend time in the parks (Luxembourg is awesome). Many cathedrals are free, and the Louvre is free the 1st Sunday of the month. Worth paying for: La Sainte Chapelle. And you cannot beat just walking around and getting lost. For food: the bakeries are cheap and wonderful. .-= Dad is in the House´s last blog ..On Canning and Foodie Warfare =-. Oh. . . do you have time to go to Montmartre and possibly step into SacrÃ© Coeur. I do that ritualistically (or used to) when I go to Paris. To me, that is Paris. (It’s free) especially wandering along the little streets . . . I live in the South of France and I haven’t been to Paris since 2001! Sigh . . . The Hotel de Ville always has some free exhibit or another, and they're often so good you have to wait in line. 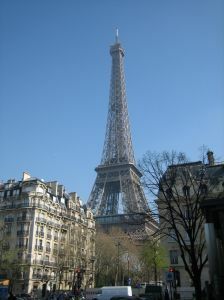 The last one I caught was excellent – all about Eiffel (the man, and all the stuff he did in addition to the tower!) I didn't make it in to the Doisneau exhibit – the line was toooo long. Good luck! .-= Mickey´s last blog ..“She owns the subject…” =-. .-= Mo´s last blog ..last thing on thursday night and =-. Palais Royal (free) is a great place next to the Louvres : nice arcades with expensive shops (one with Vintage clothes is simply fabulous). I have been trying to live frugally in Paris for a couple of months now. I don’t understand why people love Shakespeare and Co. I find the staff rude and the books overpriced. I love Galignani on Rue de Rivoli which has a great range of English books and next door Angelina’s serves great hot chocolate. I think one of the cheapest places for English books is the Gibert Jeune Langues et Lettres at St Michel – they have both secondhand and new books in English, and classic novels (new) are only a couple of euro, with contemporary books (also new) being about 8-10 euro. McDonalds does a decent cafe creme for about 1.40 – perfect for taking out and wandering. Previous post: The Four Voices, Four Cards Giveaway!